Daylily plants do best in sites that receive direct sunlight for six hours a day. Incorporate good quantities of organic matter to enhance the soil’s aeration, drainage and fertility. 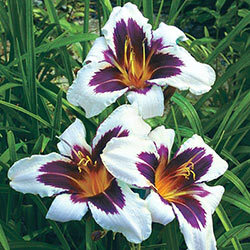 Daylilies are exceptional in their diversity and the myriad it can be utilized in the garden. They make stunning border plants, are excellent for mass plantings along walkways or fences as well as for landscape plantings in combination with compact shrubs or ornamental grasses. Spring offers the ideal time for planting daylilies, although gardeners in the South also have the option of planting late in fall. Till the soil to a depth of 30 cm and dig planting holes that are a little larger than the root mass, at least 18 to 45–60 cm apart from each other. Make sure you spread the roots out as you sow, and that the crown doesn’t end up any deeper than 2–3 cm under the soil surface. Pat the ground lightly to firm up the surface after refill and water thoroughly. Daylilies require regular irrigation for optimum growth. Mulching isn’t a necessity, but is useful in areas susceptible to weeds and excessive heat.